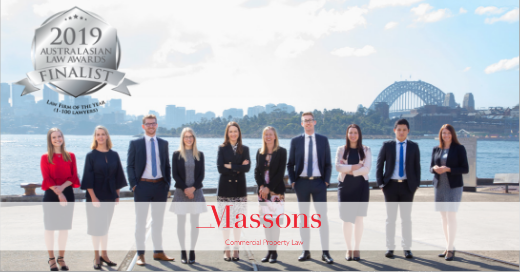 We are delighted that Massons has been listed in the Doyle’s Guide of “Leading Property & Real Estate Law Firms – NSW, 2018 and that both of our partners, Jodie Masson and Leisha de Aboitiz have been listed as “Leading Property & Real Estate Lawyers – NSW, 2018”. Doyle’s Guide is compiled using “online peer-based surveys as well as extensive telephone and face to face interviews with clients, peers and relevant industry bodies” so a big THANK YOU must go out to our wonderful clients and our respected peers in the legal industry – thank you! 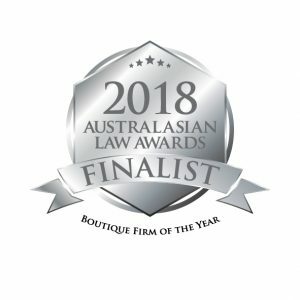 Massons is pleased to announce that it is a finalist in the 2018 Australasian Law Awards for Boutique Firm of the Year. Winners of categories in the Australasian Law Awards will be announced in May 2018. Massons partner Leisha de Aboitiz has responded to calls from Lawyers Weekly to identify the major trend impacting the Australian legal sector. Ms de Aboitiz said specialisation was the ‘rising giant’ in Australian law. “There is an increasing number of breakaway firms who are responding to client demand for specialist knowledge. While this has seen a rise in boutique offerings, it is occurring at all levels in the legal market. 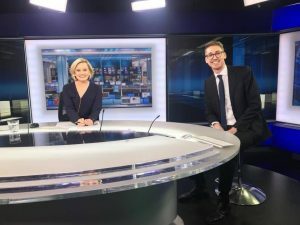 For example, there are a number of global and national firms who have either re-structured around core practice areas, or who have entered the Australian market with the express intention to focus on a particular industry or discipline,” she said. Ms de Aboitz said factors driving specialisation include the rise of artificial intelligence, increased demand from in-house legal teams and clients being more willing to hand pick the right team for the right advice. The change only applies to contracts entered into on and from 1 July 2017. – Ben Malone. 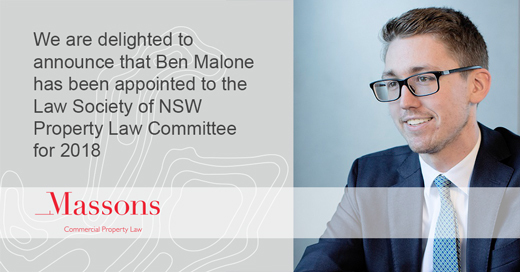 Our Senior Associate, Ben Malone, has been named as a finalist in the prestigious Lawyers Weekly ‘30 under 30 Awards’ for Construction and Real Estate. 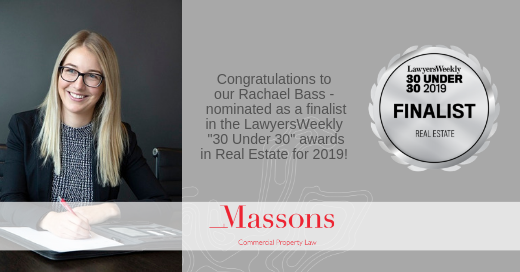 Now in its fifth year, the 30 Under 30 awards programme recognises young lawyers striving for professional excellence within their specific practice area. Ben has been with our firm since its inception, acting on significant real estate transactions for a broad range of clients across Australia. He is drawn upon regularly for his deep knowledge of property law. We’re delighted to see him recognised by his peers and clients for his outstanding and diligent work. The category winners are due to be announced on Friday, 23 June 2017. 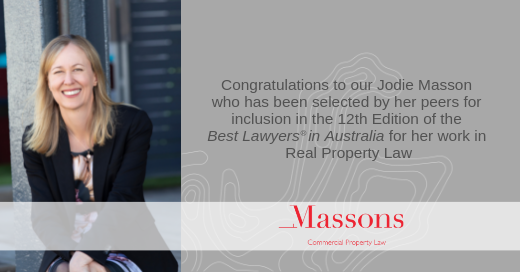 Congratulations to our Partner, Jodie Masson, who was recently selected by her peers for inclusion in The Best Lawyers in Australia 2017™ in the field of Real Property Law. Best Lawyers® is the oldest and most respected peer-review publication in the legal profession. It strives to ensure that a listing in its publication signals not only legal expertise, but also, ethics and professionalism of the highest calibre. 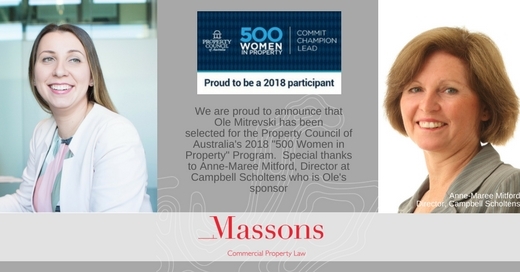 We continue to be both energised and humbled by the support we have received from the Australian property sector since our establishment in July 2016– support which has led to us being named as an Innovative Law Firm in the 2016 Australasian Lawyer Awards, and a finalist in the 2016 Women in Law Awards in the category of ‘boutique diversity law firm’. Incredibly, thanks to the nomination of our clients, we have now been named as a finalist in the 2017 Australasian Lawyer Awards in the category of Boutique Firm of the Year. This is not only an honour but confirmation that our decision to break from the traditional law firm model was the right one. We proudly work for some of Australia’s best known companies, and deliver a service that is built on an ethos which favours relationship building and excellence over billable hours. Our team is passionate about property and delivering outstanding solutions for our clients, and as a firm we are determined to prove that a happy, diverse, team-based culture is a better path to profitability and staff retention. Retail strata owners: are you prepared? 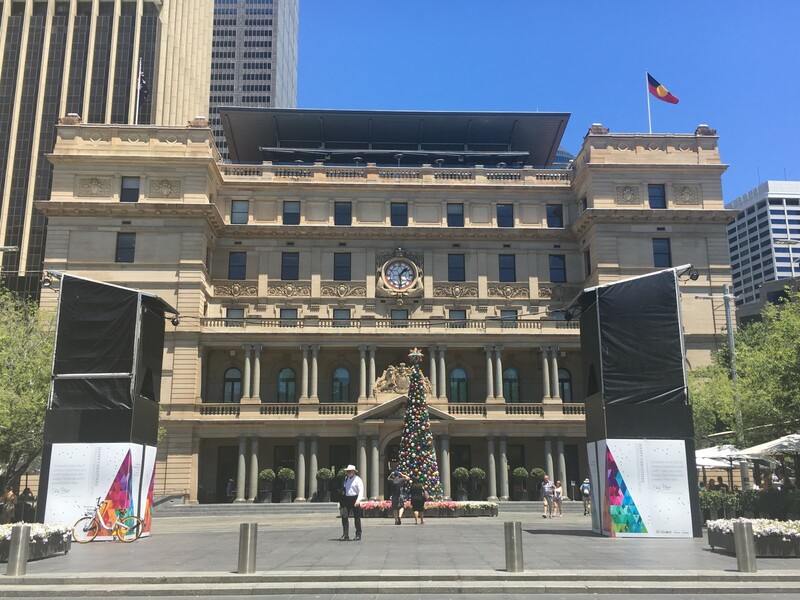 Our Partner, Leisha de Aboitiz, has provided a warning that retail strata owners need to be aware of how legislative changes being applied in NSW to the Strata Schemes Management Act and the Strata Schemes Development Act will impact them. To learn more, read Leisha’s insights in the December edition of Shopping Centre News here. Leisha de Aboitiz and Leila Packett have shared their insights into one of the most talked about features of the new Strata Schemes Development Act 2015 NSW with members of the Real Estate Institute of NSW. To find out how the new regime affects you, and in particular how the sale of strata schemes can now be undertaken with a majority vote, visit the REINSW website here. 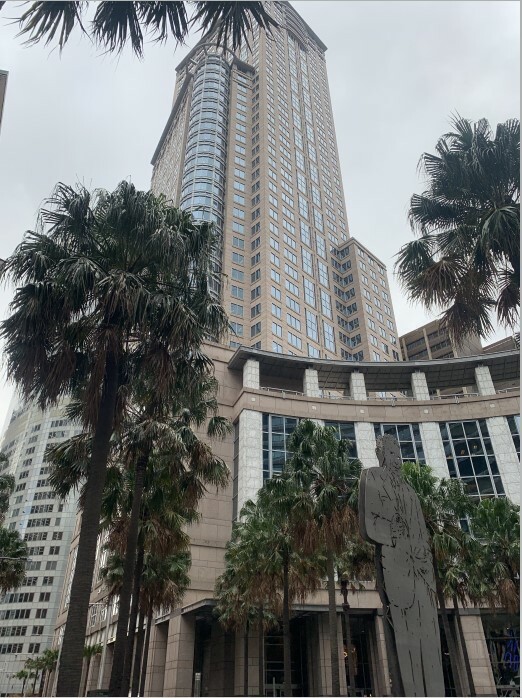 The team at Massons has issued a strong recommendation to all strata schemes that changes to strata by-laws not yet registered should be lodged for registration before the new reforms begin. Strata schemes should take urgent action to lodge changes to by-laws (approved by special resolution) for registration before the new strata reforms begin on 30 November 2016. Click here for more information. On 12 November, changes to the Australian Consumer Law took effect, voiding “unfair terms” in certain small business contracts. In particular the ACCC has taken issue with broad indemnities, termination and make good clauses in retail leases. On 25 November, the QLD retail shop lease reforms finally start – new tenant termination rights and landlord disclosure obligations to name a few. – Ben Malone, Lawyer. Twenty-five neighbours recently grouped together to sell their properties for a premium. This type of activity is happening all over Sydney and seems to have no signs of slowing down. It’s important to appoint a good team that can go in and bat for you – good luck to Sam Brewer and team with the proposed sale. – Ben Malone, Lawyer. Are you an operator of a gaming machine? Amendments to the Gaming Machines Act 2001 commenced in March which provide some guidance as to the future of the Centralised Monitoring System (CMS) once the current licence expires in November. The CMS monitors gaming machines and one of its functions is to calculate the gaming machine tax. Given that the new CMS licence will be granted via a tender process, it will be interesting to see if any cost cutting measures will actually be passed onto operators. – Ole Mitrevski, Senior Associate. For those registering documents at Land and Property Information (LPI) in NSW, be aware that there are fee increases (and some decreases) on and from 1 July 2016. Some of the changes aren’t significant (eg lease registration will increase from $109.50 to $136.30) and there are probably bigger issues to deal with in most transactions, but it might be worth thinking about timing of registration, particularly if you are registering a lot of documents. It all adds up, right? Requisition fees will also be charged from 1 January 2017, making registration of non-compliant documents much more costly. – Jodie Masson, Partner. Heard the news on Monday about a major fire at the Whitsunday Shopping Centre at Cannonvale, near Airlie Beach. It’s tragic for all those who work and shop there and it is a good reminder for landlords and tenants to not gloss over damage and destruction clauses when negotiating leases – these types of events do happen and it’s important to have an agreed process in place to avoid a dispute at a time when you can least afford it!. – Jodie Masson, Partner. This article is interesting but, having interviewed graduates over many years for large law firms, this is not where the problem lies. The graduate intakes that I saw comprised smart, talented young people from different cultural backgrounds, genders (in fact, firms had to work hard to get male candidates given the large number of female graduates), sexual orientation, universities, schools etc. But they don’t stay. More initiatives are necessary (not just token ‘committees’) which support diversity in senior levels, because that’s where the real problem is. – Jodie Masson, Partner.